Manage your content across all your sites and mobile applications in one place. Easily add workflows and governance to protect your reputation while streamlining digital content processes. Create, upload and publish your content in one place, from posts, to videos, to files and more. 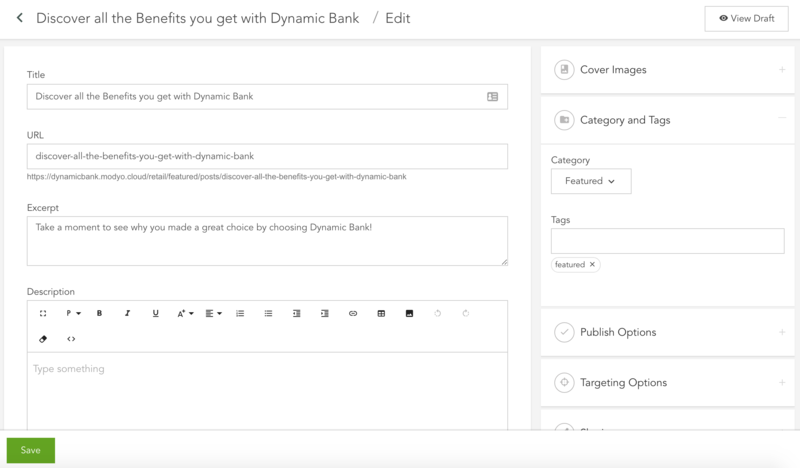 Publish your layouts and display content by selecting the specific category or tags. Send your content anywhere, even outside the Modyo platform, via the Modyo API. Create and customize different content types for your different audiences and purposes. Add detailed location information to show specific benefits close to your customers. Activate Modyo workflows to add review and approval steps before publishing to protect your reputation. Make life easy for content managers. Use different content types in any layouts or widgets, and if they need to change a button, a link, or an image, managers can simply change the relevant custom field. Target any content to specific customers based on data that you either feed into or generate from Modyo. Respond to customer segments updated in real time for personalized content. Manage all your content with categories, subcategories and tags. Using the taxonomy you create, keep all your content relevant and well-organized by your content managers. 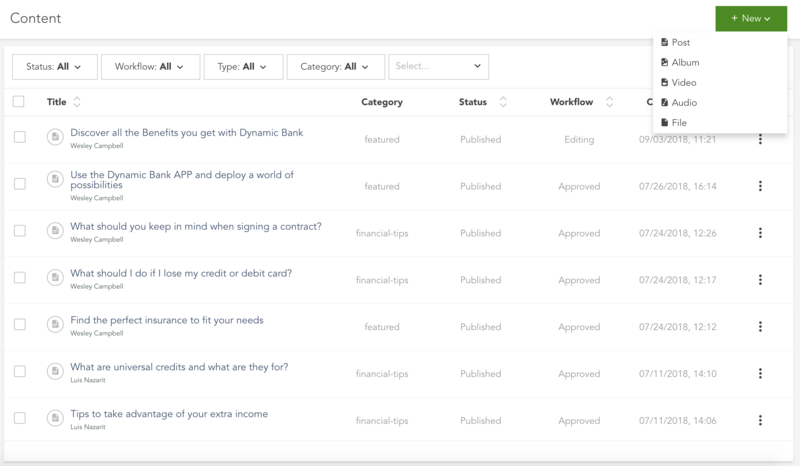 Activate workflows with reviewers and approvers, establishing easy content processes that protect your reputation. Establish rules and comment on changes step-by-step to create an easy audit trail. Publish and unpublish all your structured content at specific dates and times. Setting up publishing lifecycles for date-sensitive promotions and content is easy and simple to maintain. Make it easy for your customers to find your locations and branches. Create all your locations and branches once, adding special criteria as to what product, service or feature is offered at each location. Use Modyo as a headless content management system through the API, and send your content to any site or device. Let your content managers write once, then publish anywhere across all of your channels. Create promotions with specific location data. Add multiple locations where your customers can enjoy benefits, and use their location to responsively display promotions based on how close they are. Using Liquid Markup you can add logic to the content in your digital channels. You can create content that automatically changes and reacts based on where it is and who is seeing it. Visit our documentation to learn more.